The new US National Security Advisor John Bolton controversially advocated the so-called “Libyan model” for North Korea’s denuclearization. While he was indeed speaking about the technical aspect of this example in having the North African country completely surrender all of its nuclear-related capabilities, others are interpreting it differently and almost as a Freudian slip given that it was precisely because of Tripoli’s sincere adherence to this model that it was defenseless in deterring the NATO-led war that ultimately led to its destruction in 2011. On the surface, it makes one question why any country, let alone North Korea (whose media specifically said right after the beginning of the NATO campaign that Libya should have kept its nuclear program), would ever follow that model, but then again there’s a lot speculatively going on behind the scenes that the public isn’t privy to. The entire denuclearization process is such a sensitive one and full of face-saving moves by all sides that it’s unlikely that Bolton would recklessly jeopardize the process by speaking as boldly as he did without he and his “deep state” handlers being certain that it wouldn’t offend Kim to the point of pulling out of the talks for reasons of national dignity. The opposite is actually happening, and he’s instead welcoming American and other experts to observe the decommissioning of his country’s mountainous nuclear test site later this month and even invite the media to report on the entire process. Furthermore, all of this is going ahead despite a South Korean presidential advisor saying last week that North Korea wants “American investment…sponsors, and multinational consortiums” coming to the country, which the man predicted could eventually lead to McDonalds and even a Trump Tower opening up in the former so-called “Hermit Kingdom”. 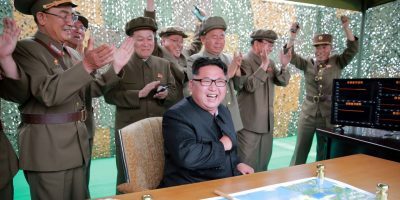 For all intents and purposes, North Korea has reversed its previous position and is now willingly – and one could even say, eagerly – doing exactly what Libya once did, especially in regard to surrendering its tangible deterrence capacities in exchange for simple promises that don’t remove the regional threat posed by American forces. It can only be conjectured at this point why Pyongyang is doing this and whether it’s related to the reported collapse of its mountainous nuclear test site that some rumors allege might have been destroyed by a new type of American weapon, but conventional analyses point to China’s active participation in the latest UNSC sanctions regime against North Korea as being one of the prime catalysts for Kim’s nuclear backtracking. The communist country might fear that it’ll eventually collapse without the sanctions relief that only denuclearization can provide at this point, and that its future will be much brighter if it embraces its pivotal transit role in facilitating the construction of a multimodal Russian-Chinese “Korean Corridor” and courts international expertise to develop its prospective $6-10 trillion rare earth mineral deposits. Therefore, it’s because of these strategic reasons – both due to international pressure & its own prerogative as well as a mix of fact & speculation – why North Korea is surprisingly following in Libya’s footsteps, though it remains to be seen whether this risky gamble will ultimately lead to a different outcome.